A biography of America's founding father and those on whose land he based the nation's future. George Washington dominates the narrative of the nation's birth, yet American history has largely forgotten what he knew: that the country's fate depended less on grand rhetorical statements of independence and self-governance than on land - Indian land. While other histories have overlooked thecentral importance of Indian power during the country's formative years, Colin G. Calloway here gives Native American leaders their due, revealing the relationship between the man who rose to become the most powerful figure in his country and the Native tribes whose dominion he usurped.In this sweeping new biography, Calloway uses the prism of Washington's life to bring focus to the great Native leaders of his time - Shingas, Tanaghrisson, Bloody Fellow, Joseph Brant, Red Jacket, Little Turtle - and the tribes they represented: the Iroquois Confederacy, Lenape, Miami, Creek,Delaware; in the process, he returns them to their rightful place in the story of America's founding. The Indian World of George Washington spans decades of Native American leaders' interaction with Washington, from his early days as surveyor of Indian lands, to his military career against both theFrench and the British, to his presidency, when he dealt with Native Americans as a head of state would with a foreign power, using every means of diplomacy and persuasion to fulfill the new republic's destiny by appropriating their land. 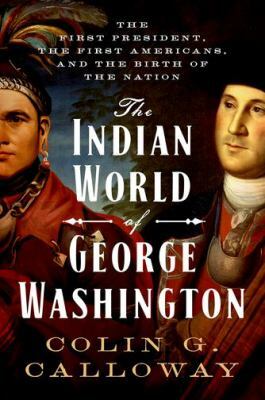 By the end of his life, Washington knew more than anyone elsein America about the frontier and its significance to the future of his country.The Indian World of George Washington offers a fresh portrait of the most revered American and the Native Americans whose story has been only partially told. Calloway's biography invites us to look again at the story of America's beginnings and see the country in a whole new light.